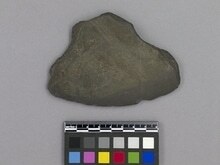 Item number 1060/34 from the MOA: University of British Columbia. A black-brown knife, oval in shape narrowing at the handle and flaring outward at the blade. Around the outer edges of the blade, there are a series of irregular chips that create the general shape of the piece.